There's always a new pair of shoes that I want, especially at Christmas, it's when all the shops bring out the prettiest ones, ready for the party season! I've put together a wishlist for you guys, some practical, some for big nights out and some are just super cute! 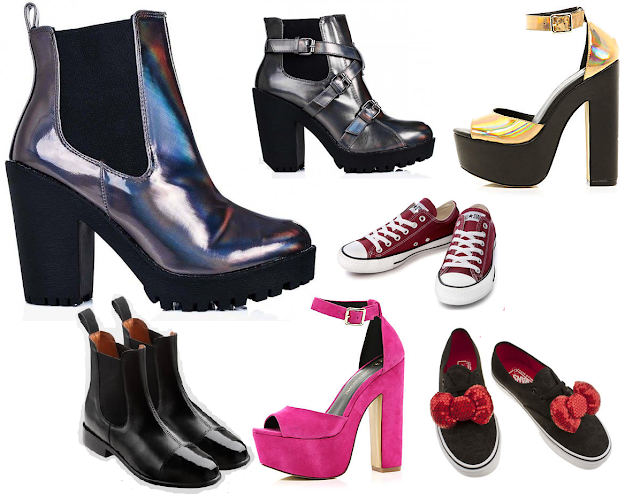 Petrol Hologram Boots - SpyLoveuBuy - As usual, you can expect shoes from my favourite place! I have seen these shoes floating on other stores but I cant remember where. I am obsessed with holographic materials at the moment as you may have noticed and these darker ones are something new for me! There are also the kind of boots that are going to be very comfy with their block heels and rubber sole! Gold Hologram Heels - River Island -Another new holographic tone for me - Gold! I didn't even know this kind of colour existed but I absolutely love it. These and the pink ones are both the same shoe from River Island, they always do the best shoes, but are normally quite expensive for me. I love the ankle strap and a peep toe is my favorite style. Converse - Oi Polloi - Whilst looking for presents for Andrew I came across this website! I ended up getting side tracked and finding a pair of shoes that I wanted for myself, typical! My converse have been my number one pair of shoes for a while now and I've already gone through 3 pairs of the exact same shoes. These are the same style just in maroon and I really liked the colour! Hello Kitty Vans - Schuh - These are so cute! I've been a big vans fan since I was 13, wearing the black and white checkerboard ones and I am still a big fan now! I love the shiney muted kitties on the black bit and the sequin bows are just amazing! Boots - Equestrian Clearance - This morning, I took Molly for a walk. Shock horror I know, I don't really do walking but it's my dads birthday so I did it for him. I went in my beloved converse and came back covered in mud so I definitely need something like this! Short boots to keep my feet warm and mud free - perfect for forest walks and fashionable at the same time. I love the patent shine on the toe caps! What Shoes Are You After This Season? Ahaha I love the Hello Kitty Vans and could definitely use a new pair of converse - the maroon colour is gorgeous!